It is with heavy hearts that we share the news that our founder, Robert S. Wohlsen, F&M class of 1950, passed away on Oct. 23. Bob was the father of Millport Executive Director Lynn Wohlsen Myers and Franklin & Marshall College Director of Athletics and Recreation Patricia Wohlsen Epps. In addition to being a supporter of Millport, Bob was a generous donor to F&M. Remembrance of a dear friend -- Bob Wohlsen. Our late life relationship grew out of our common involvement in reunions of former students of the old Franklin & Marshall Academy. We served on committees starting in 1978 and continued every year to the present. Nature has, in its insidious manner, reduced attendance that is now counted by fingers on one hand! Some (I can’t be more precise) years ago, Bob and I were the reunion. And that led to weekly gab fests on Wednesdays at the bagel shop near the F&M campus. Subject matter then ranged across topics that included sports, the no-no's of religion and politics, and of course, the Millport Conservancy. 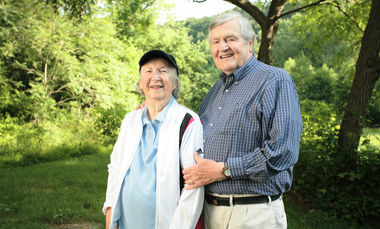 Most members of the conservancy are aware that the Wohlsen family was and is known as builders. Several generations of Wohlsens constructed hundreds of commercial and residential buildings in Lancaster County and in contiguous states. Many remain in center city Lancaster and are still active. After Bob’s tenure constructing buildings, he branched out, so to speak. He was always an ardent outdoorsman, as attested to by his climbing mountains on the world’s most challenging peaks. So his desire to harbor natural beauty followed; hence, Millport, which he conceived and constructed piece by piece. One lovely, chilly, early autumn day several years ago, Bob invited me and my wife, Florence, to join him and his beloved wife, Carolyn, for a day’s inspection of Millport. The four of us climbed on board Bob’s off-road vehicle, known as the Gator. With Bob at the wheel, we bumped and jarred our way from east to west, north to south, covering all the Millport terrain. The route took us along a stretch of the Lititz Run, a lively, beautiful waterway that flows the length of Millport. Bob explained the conservancy worked with local government officials and sport fishermen groups to secure special designation for the run so that no dams or other obstructions would be allowed to affect the run's free flow and so that the water was sufficiently clean for fish (trout) to spawn. Millport, of course, includes that wonderful, precious old gristmill and barn that stands guard at the entry. Millport, now in partnership with Franklin & Marshall College, functions as an environmental laboratory for students studying nature’s environment. It also welcomes elementary and high school students who can increase their knowledge of the earth that surrounds them. The conservancy now and in the future is a testament to the generosity of spirit and outreach to all that was an integral part of Bob’s humanity. I miss him today and all the tomorrows, especially the Wednesdays, that follow. Thanks to everyone who participated in the 2014 ExtraOrdinary Give (held on Friday, Nov. 21) with the Lancaster County Community Foundation! We received a total of 56 contributions in 24 hours, a wonderful boost of support for Millport. Total contributions were $5,050, and will support painting, restoration and enhancement work on the historic Millport Roller Mill and the barn in order to make them even more valuable resources for our community. Last year we raised money to support the building of a new bridge at Millport, and that bridge is now complete! We hope you enjoy these photos of the process. Thank you once again to everyone who helped make the new bridge a reality! If you were not able to participate during the 24 hours of this year's Extraordinary Give, it's not too late to support Millport. Become a member today for a minimum of $35, or give a gift of any amount to support the work of the Millport Conservancy and enter "Millport" in the special instruction box. In July's newsletter, we wrote about F&M's freshman orientation and enrichment program, PIT (Putting It Together in the community), and the students' experience at Millport. 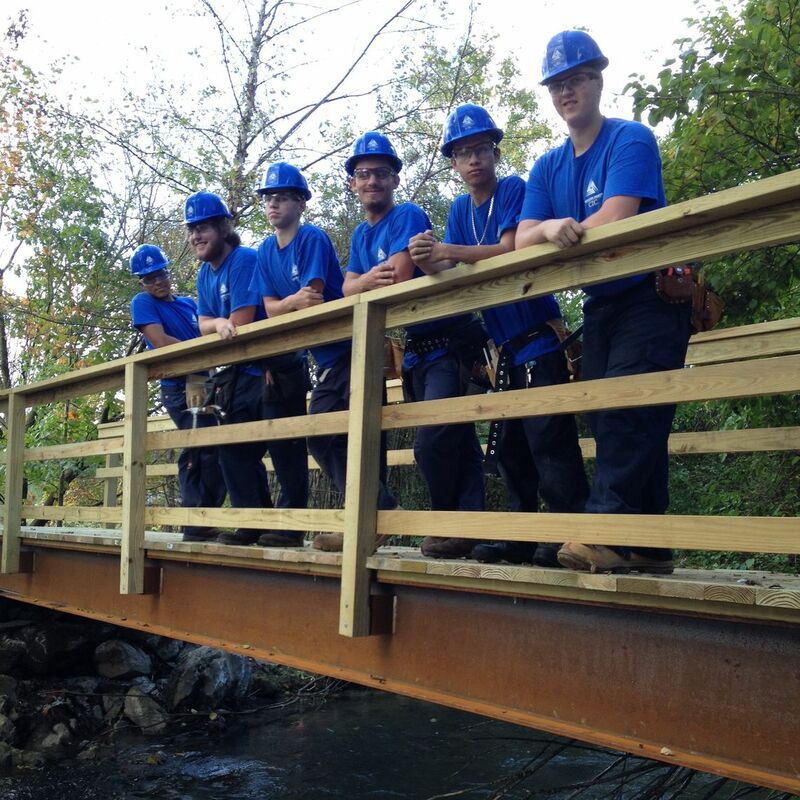 Every year the students work at Millport and experience the trails and the beauty of nature as part of a week-long experience getting to know the community where they attend college. Every August, many incoming first-year students at Franklin & Marshall College arrive on campus early as part of the Putting it Together in the Community program (PIT). PIT participants work with various organizations throughout Lancaster; the group that helps at the Millport Conservancy is known as Clean Air Clean Water (CACW). Participant Matt Henninger '18 further explains, "PIT is a four-day program that shaped the start of my involvement here at F&M. My PIT group (CACW 2014) worked at Millport, which gave us the opportunity to make an impact in our new community and meet some amazing people along the way. Several members of my PIT group are my closest friends on campus, and I am grateful we were able to meet so early in our college careers and share this incredible experience." Morgan Torstenson '18 agrees. She says, "PIT was an incredible experience that allowed me to get a jump-start on getting involved. It gave me the opportunity to meet my close friends here at F&M. I'm glad I got to start my college experience at such a beautiful facility dedicated to preserving the land." During their days at Millport, the CACW students spent time "clearing trails and painting fences while enjoying the beautiful landscape. We even had the chance to paddle out to the middle of the pond and dive in," says Wyatt Behringer '18. The students who choose to work at Millport enjoy these outdoor activities. 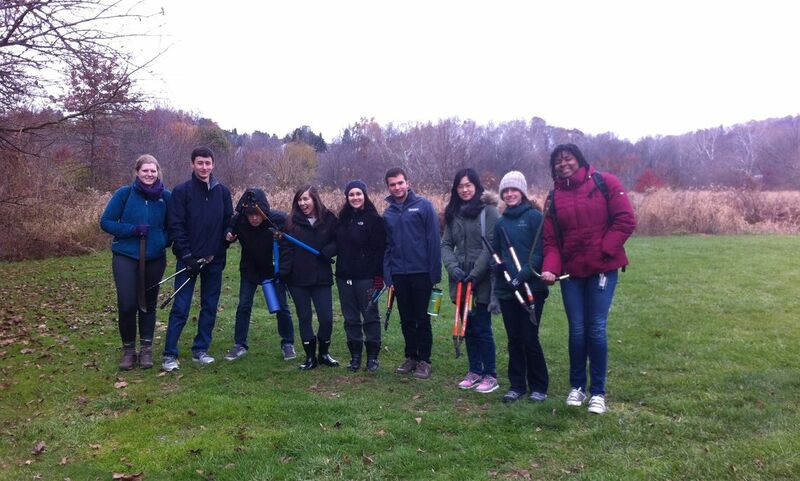 Jenny Deasy '18 reports she is "so happy I was able to participate in clearing trails for Millport in the hope of making it even more accessible to the community and a place for all to enjoy." Becoming familiar with Millport early in their college careers leads to a connection with the area. Students fall in love with more than the F&M community during PIT. They feel a sense of belonging through friendships with their fellow participants, and those who participate in CACW feel like they are a part of Millport. Leslie Botey '18 says, "Millport Conservancy made me feel less homesick. After living in Vermont and having to come back to the city, I was really grateful to have a calm environment surrounding me again before I started my first year of college." Bridget Johnston '18 summed it all up by telling us, "Millport is a stunningly well kept area of land. Its nature trails seem to transport you away from your hectic daily lives and into a place of calm. It's an incredible privilege to have access to it as part of Franklin & Marshall College." Here's a link to the PIT video that includes some footage taken at Millport this past summer -- watch for Millport Executive Director Lynn Myers! 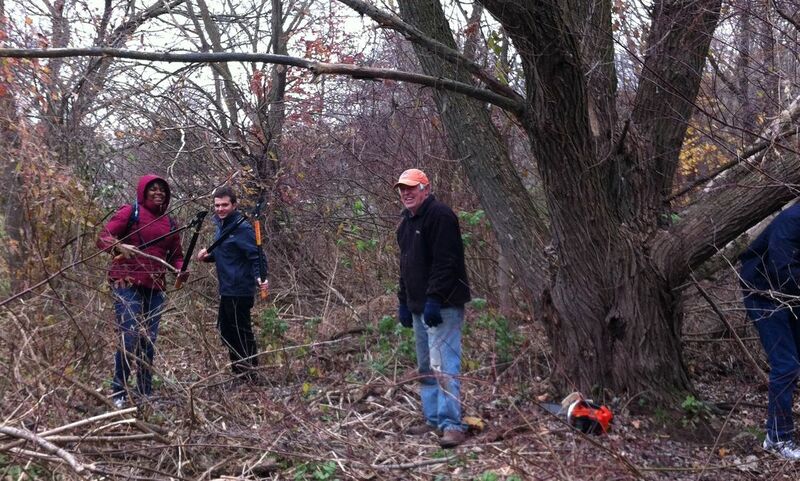 Students from F&M, led by Dean of New College House, Assistant Dean of the College and Adjunct Professor of Earth and Environment Suzanna L. Richter, Ph.D., helped clear a trail connected to the new bridge at Millport earlier this semester. The trail starts across the new bridge and connects to an existing trail along the Lititz Run. Keep Up with What's Going on at Millport! Check out our Facebook page to get all the updates on events at the Millport Conservancy. Upcoming events include the Christmas bird count!